The Whip Around 'Inspections' module is where you can view all of the reports submitted by drivers. You can view and export individual reports or multiple reports for a DOT audit. You can access the Inspections module by logging in here. Click on the 'Inspections' module from the menu on the left. 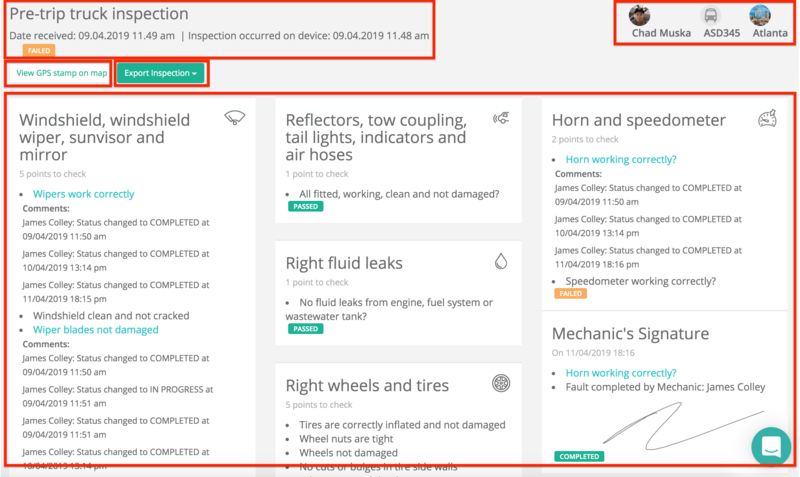 Please note: You will need to have had some inspection data created from the drivers app to see inspections in this module. To learn how to do an inspection click here. From the Inspections module you can view your list of inspection reports filter by date range, status, Driver, Vehicle, team, form or multiple fields at once and click into each to view the individual fault. You can also export your list of inspections to csv. When you open up the individual inspection you can view the form name and when the report was received into the dashboard and when it was completed on the app (top left). You can see the driver, vehicle and team (top right). You can view on a map where the inspection was conducted and export to csv or pdf (middle left). You can also scroll down and view all the details of the inspection report, including the faults and all the notes from the managers and mechanics along with the mechanic's signature.